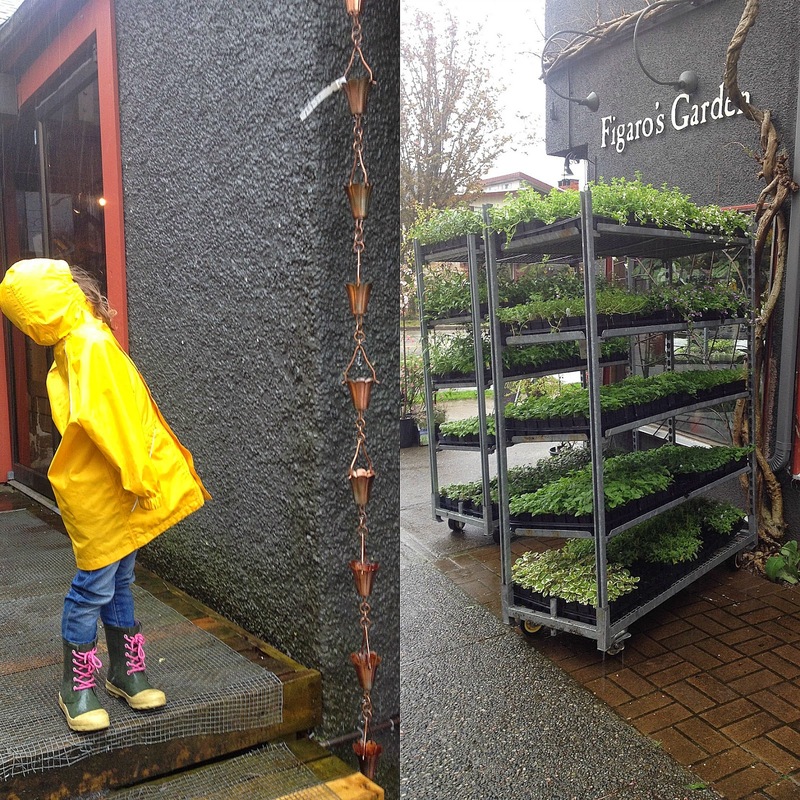 In Vancouver there is an abundance of adorable gardening places- among them is Figaro's Garden- just off Commercial Drive- nestled in the heart of a quiet neighbourhood. With the skies opening up on Sunday there wasn't much on our list of things to do- this is the perfect time to run errands of the leisurely sort- like stocking up on herbs for the garden and learning all about planting blue berry bushes in containers. As I mentioned earlier I wasn't planning on gardening much this coming season- but as things are popping up green I can't help myself. 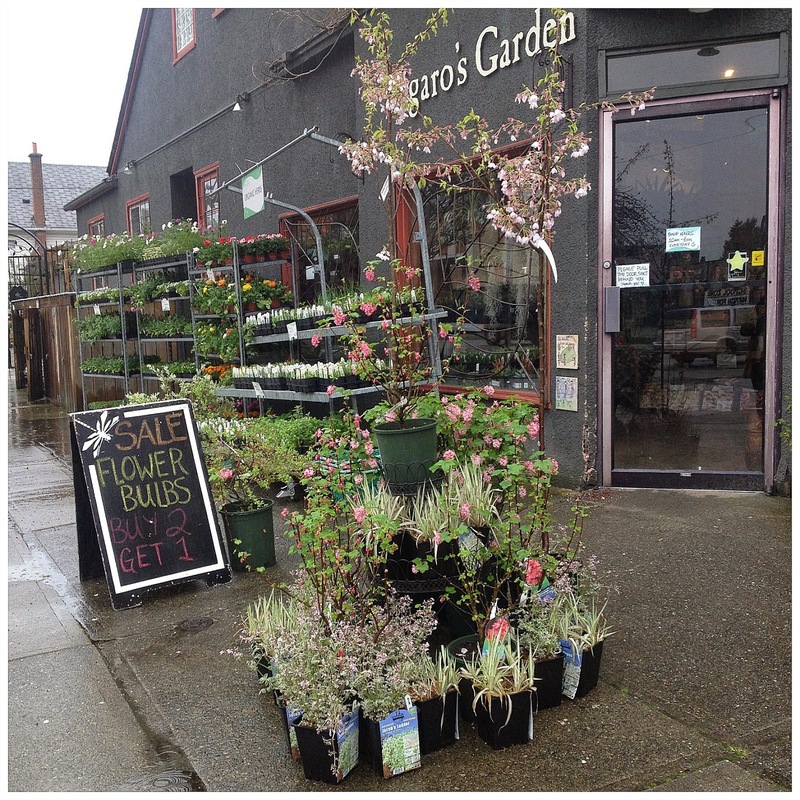 Figaro's is chock a block full of early Spring herbs- decorative flowering plants and most important of all seeds. An impressive seed wall lines the back of the store- the tiny packets of possibility beckoning- urging one to try just one more time. So we do- lettuce seeds, carrot seeds, Swiss Chard and even some mystery flowers all go into our basket- along with a few carefully chosen- low maintenance early starts. 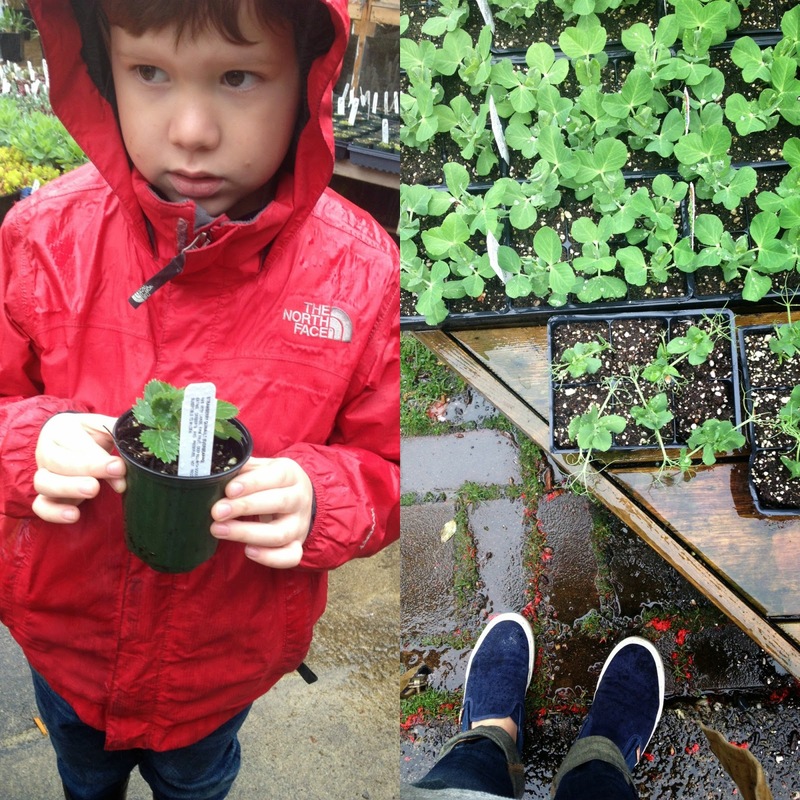 About the only thing I haven't killed off yet- aside from Kale- are our strawberries and so The Boy was sadly disappointed when he picked out a new strawberry plant that we have no room for. Back the strawberry plant went and some Thyme was grudgingly agreed upon- I feel this is a somewhat ironic choice. 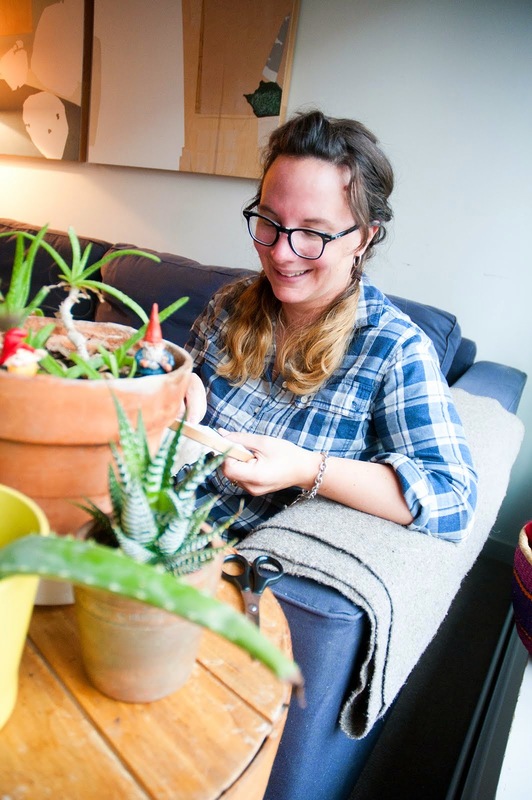 A small cactus named Spike also came home with us- a fat cat named Wilbur did not. 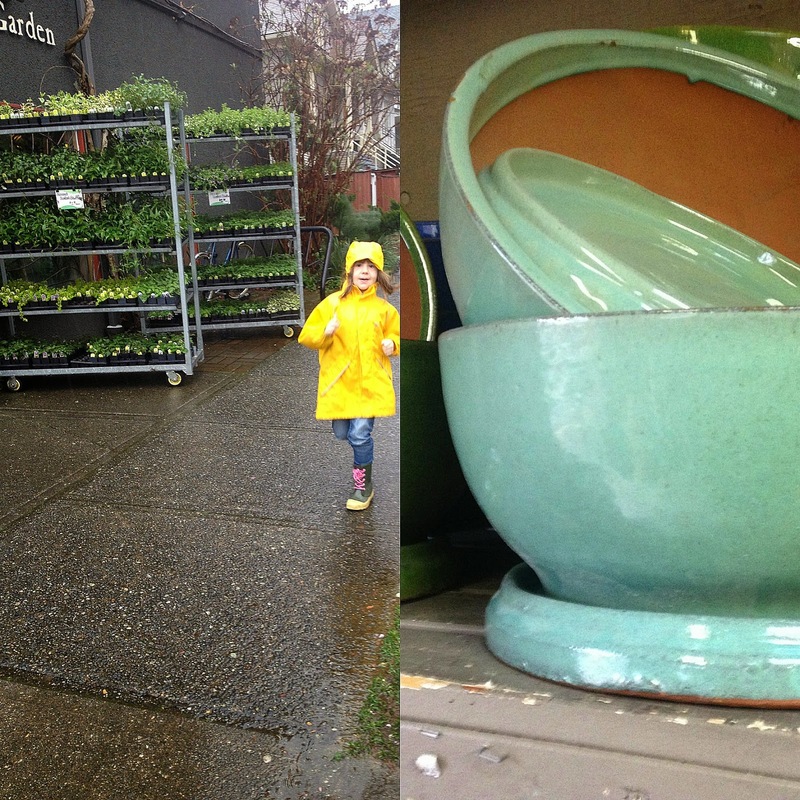 This quiet little visit to the garden store was just the thing to get me in the Spring mood- once home my Girl and I spent the better part of our afternoon pottering about the deck- nestling our new friends into their new homes. Tidying and pruning what remains from last year- watering everything. 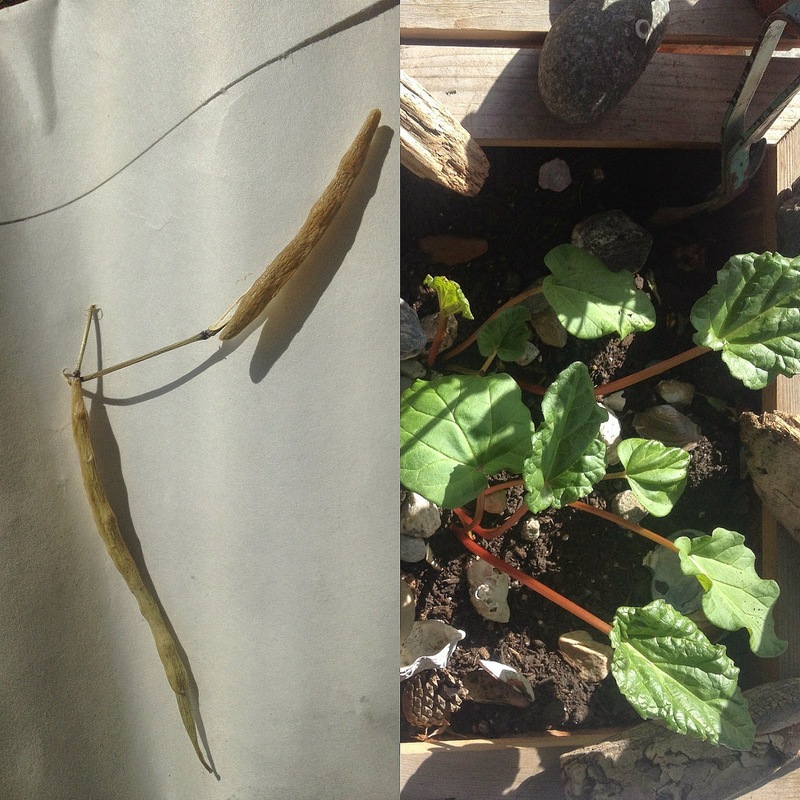 While I may not have the greenest thumb my heart is pure- I really want to grow things- I really want to have a garden- I am hoping that maybe- just maybe this year will be there year I figure it all out! 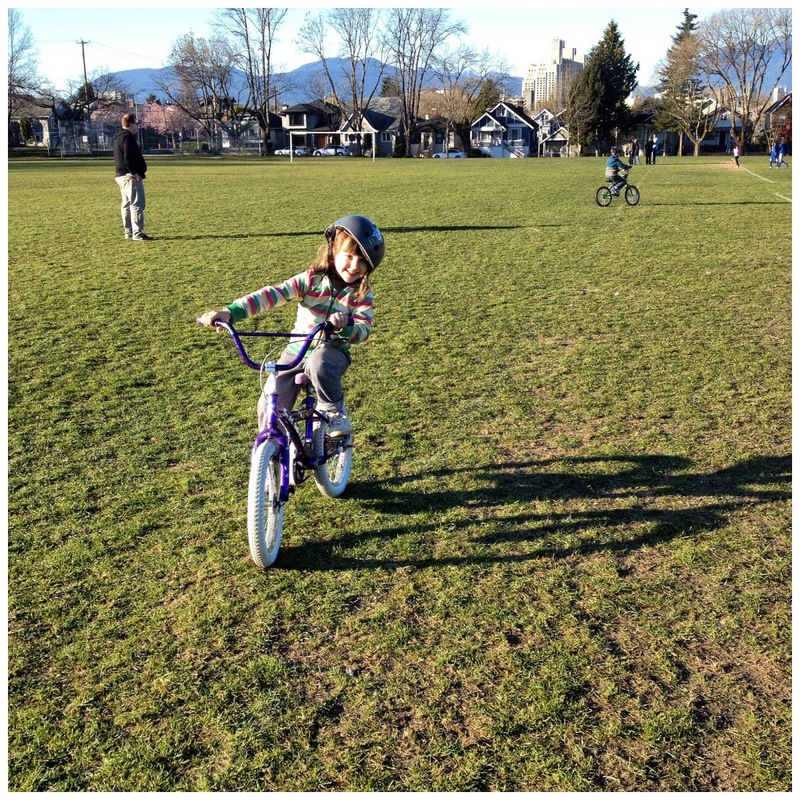 As Spring Break draws to a close it has become quite evident that there is a bit of a them happening this year- sunshine- new runners and bikes- lots and lots of bikes. Every year our family likes to make a bit of a bucket list- fun things to tick off as the year unfolds- at the top of the kid's wish list this year was to learn to ride their bikes with out training wheels. First of all I love that this was our kid's wish- not to go someplace or do something extravagant but to ride their bikes with out training wheels- as parents this was something we could easily give them. 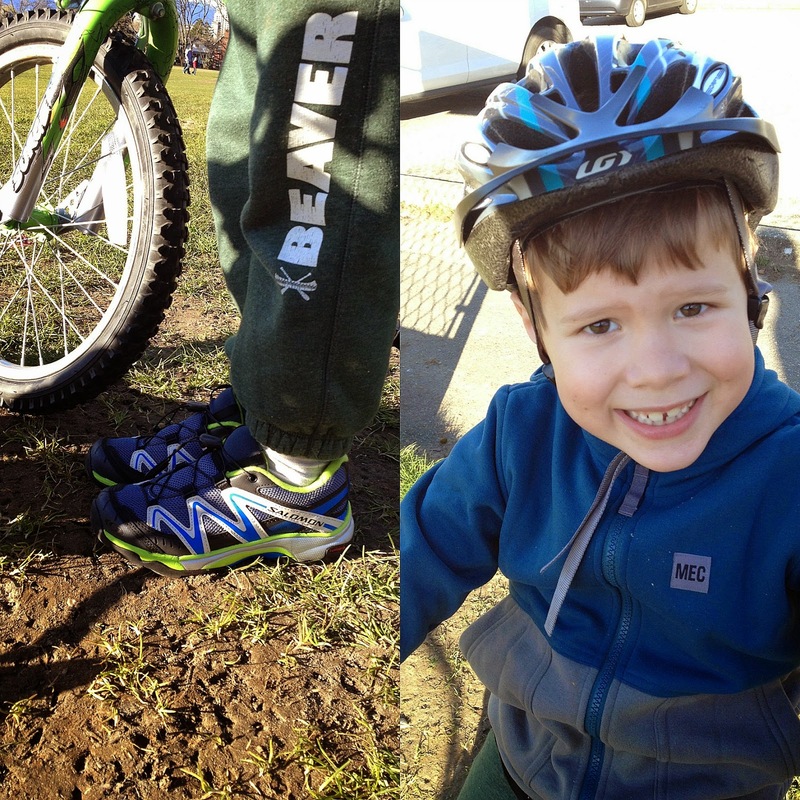 I really have to give credit where credit is due- the Mr. has been riding with them all winter- on the weekends when I have been at work- it was only a couple of weeks ago that the training wheels came off and I happened to be there to witness the big moment. 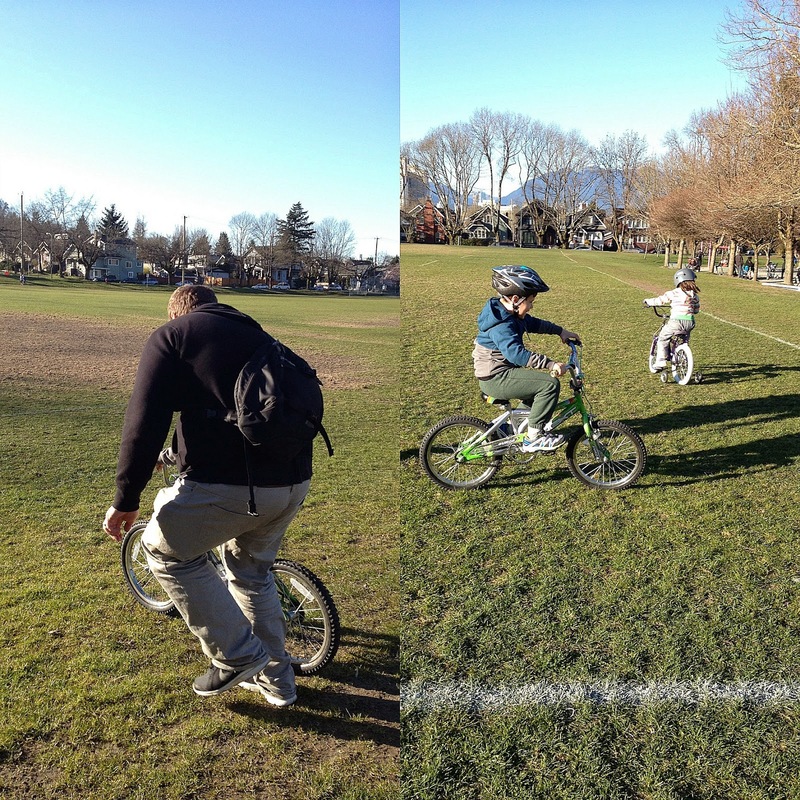 It's the Mr. that has given these kiddos of ours the confidence needed to ride on two wheels! First The Boy wobbled off- careening across the field and through a group of people who luckily turned out to be friends of ours from school. After seeing the success of big brother it was only a matter of minutes before the training wheels were off Miss Lo's bike and Evil Knievel replaced my little girl- off she went. Sometimes I am still amazed that these Littles are not so little any more- the things that they come up with on their own astounds me- their choices in style amazes me and their physical abilities often leave me in the dust. With this new found skill they have gained new freedom which will take them miles I have never seen- hopefully in countries I have never been- these wobbly first bike rides are the beginning of a wonderful new adventure! Friends it is Friday- the weeks are just flying by for us- we blinked and Spring Break is over- I hope you all have a peace filled weekend- much love and happiness! Happy Friday! 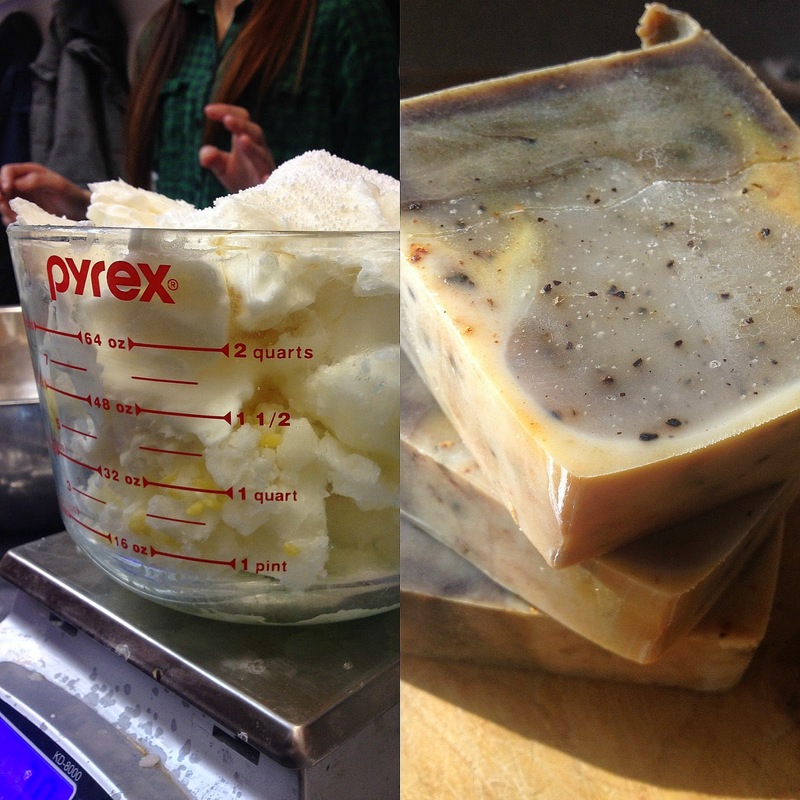 At the beginning of March my friend Andrea and I decided to take a soap making course- we are both a little "crunchy" OK maybe quite a bit and really wanted some control over what we use on our skin as well as on our children. Fuelled by the wish to learn more we both signed up for a one night workshop at a favourite local shop- The Soap Dispensary. 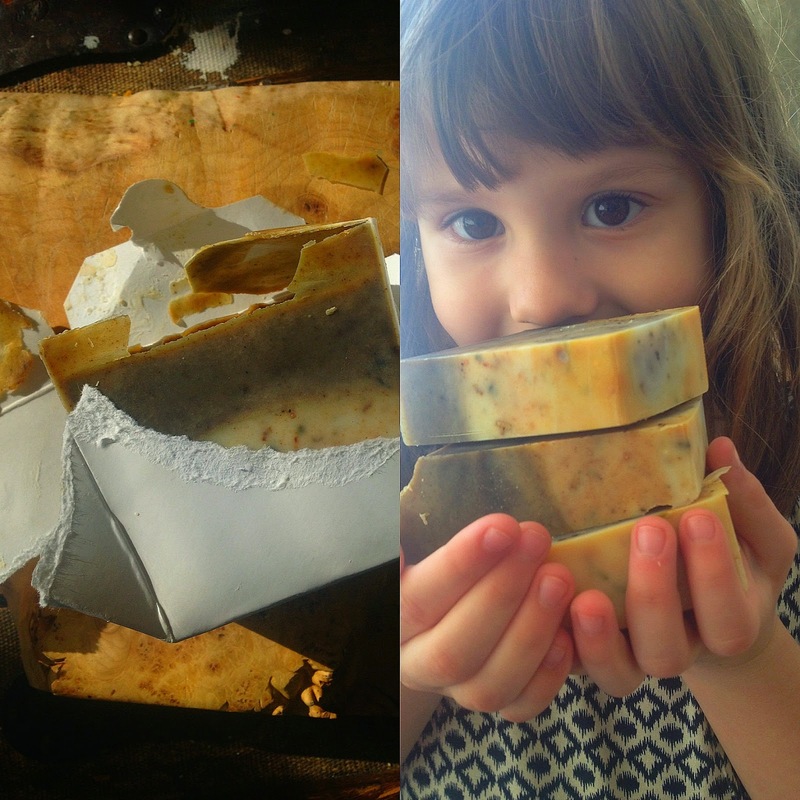 Using all natural materials we would at the end of the evening walk away with a box of handmade soap. 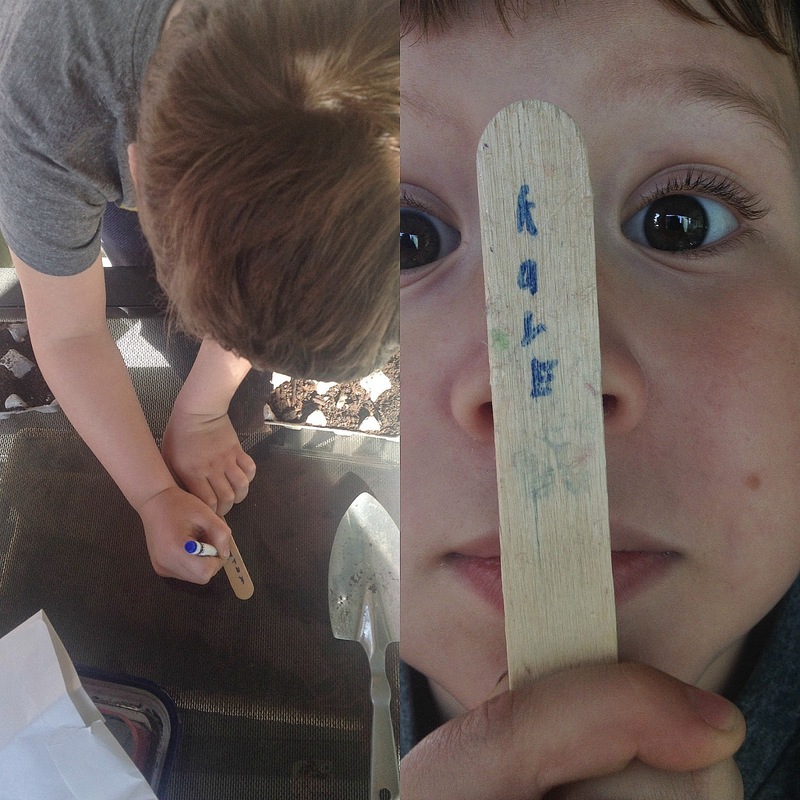 While it is true that we could have just followed a recipe we both wanted to learn from someone well versed in soap making the why and the how. For me my desire to make soap has always hit a wall whenever lye was discussed- I always wondered could lye be avoided- it sounded like such a dangerous material. Our instructor was really straightforward in her explanation on lye and it's role in soap making- there is no such thing as a lye free soap- it's necessary. 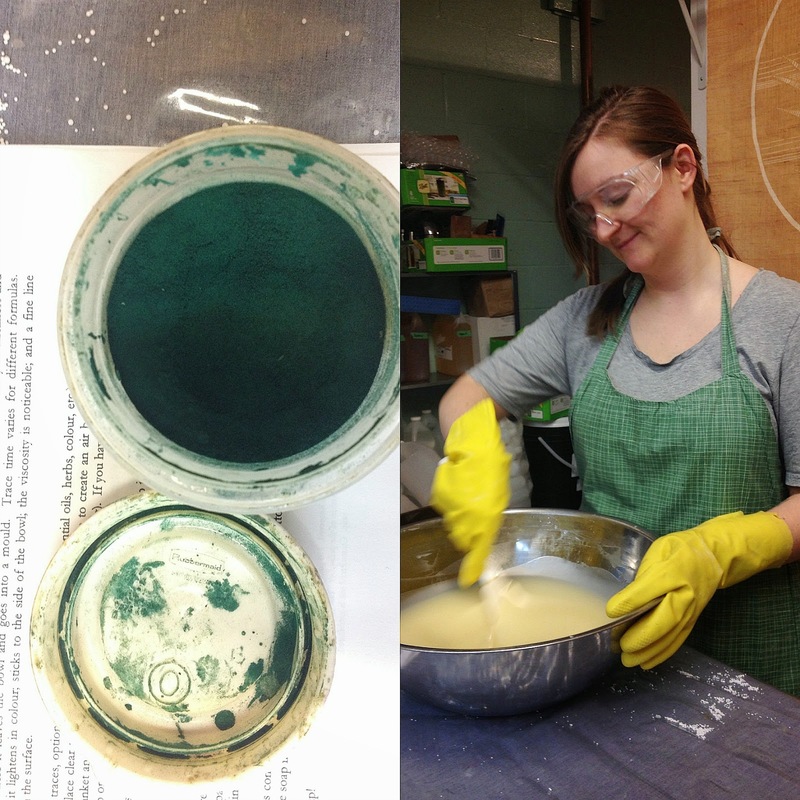 She showed us how to safely and properly handle the lye- completely dispelling any remaining worries I had about working with the material. As promised at the end of the evening each student walked out the door with a Chinese take out container full of fresh soap- carefully wrapped in a towel to keep a consistent temperature as the soap worked it's magic over the next 48 hours. I waited patiently and finally unwrapped my new soap- carefully sliced it up into three even bars which now sit curing in my art room for another week. I'm really happy I took this little workshop- it's one thing to read about something in theory online or in a book but I learn best by doing- seeing how the soap changes and comes together is only something that can be experienced in person. With my new found soap making knowledge tucked firmly away I am looking forward to making more soap this coming fall- for our family as to give away as gifts. All natural and made by me! Well it's true- it's not quite officially spring- this week is still technically winter- if you can even call it that this year! 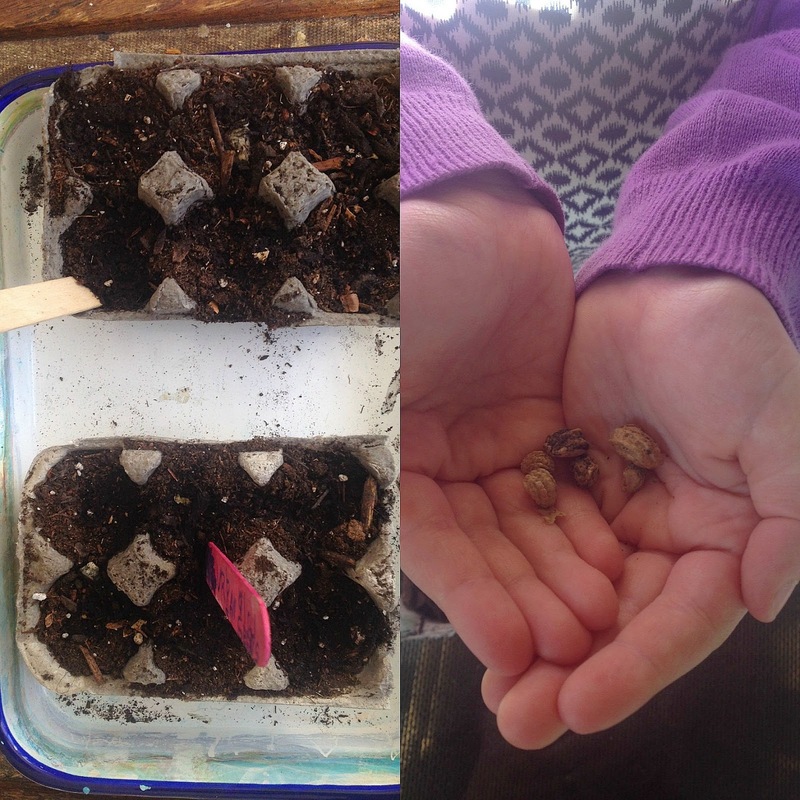 Inspired by the optimistic sunshine the Littles and I started sewing our seeds- nothing too fancy- some Kale and Nasturtium- perfect for salads on warm evenings. If you are a long time reader you may remember me swearing off gardening. By the end of last summer I was so frustrated- the lack of space combined with high winds and too much sun- everything dried out quickly and we had very little luck. Except with the Kale- and the herbs- and of course the strawberries- so this year I've decided to take a much more pragmatic approach to container gardening. 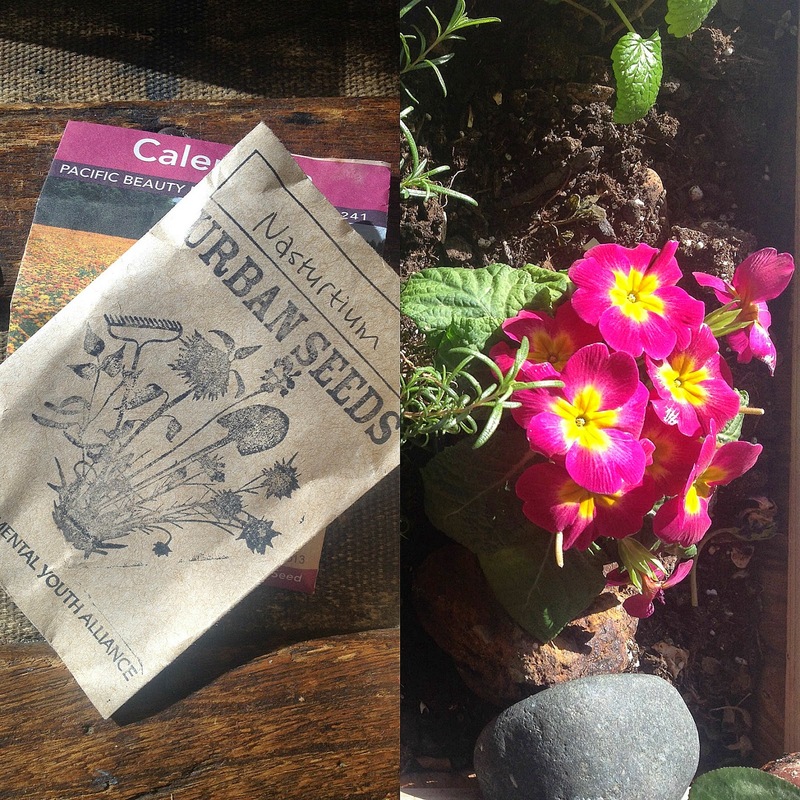 First off I am going to plant only things I know will grow- I am giving them each loads of room in each container- last year I tried to cram too many things into too small a space- even though I was following the square foot rule the containers became crowded and quickly. This year I will make sure to spread things out much more evenly. I am also getting rid of the strawberry tower which ultimately attracted birds to our deck- these rotten city thieves stole almost all our berries and I am pretty certain pecked my lettuce as well. At the end of the season I was so disheartened- I thought I had killed my rhubarb- but here it is back and sturdier than ever- this is the second full year for this plant and so I am hoping to at least be able to harvest enough rhubarb for our favourite rhubarb syrup! Or combined with some strawberries for perhaps a pie- we still have about 10 plants that came back and so I am hopeful they fruit out a bit this year. Hopeful that is the only word I have towards my garden that I can use in front of my kids! So while I am busy having major garden envy towards certain other people's flourishing gardens- containers- yards- what have you -I will be coaxing these wee city babies along- encouraging them to grow towards the light- above all I will be hopeful for yet one more year! I know things have been a little quiet around these parts- my studio updates have all but ground to a complete halt- the good news though is that the radio silence is not all for naught- wait s that a double negative? I don't care- sounds good. What I am trying to say is that most of my "spare" time which to date has been spent painting is currently being spent in the clay studio! This year in my year of making I decided that instead of buying boring store bought plates I would first attempt to make myself some really unique pieces for daily use- bowls and mugs mostly. 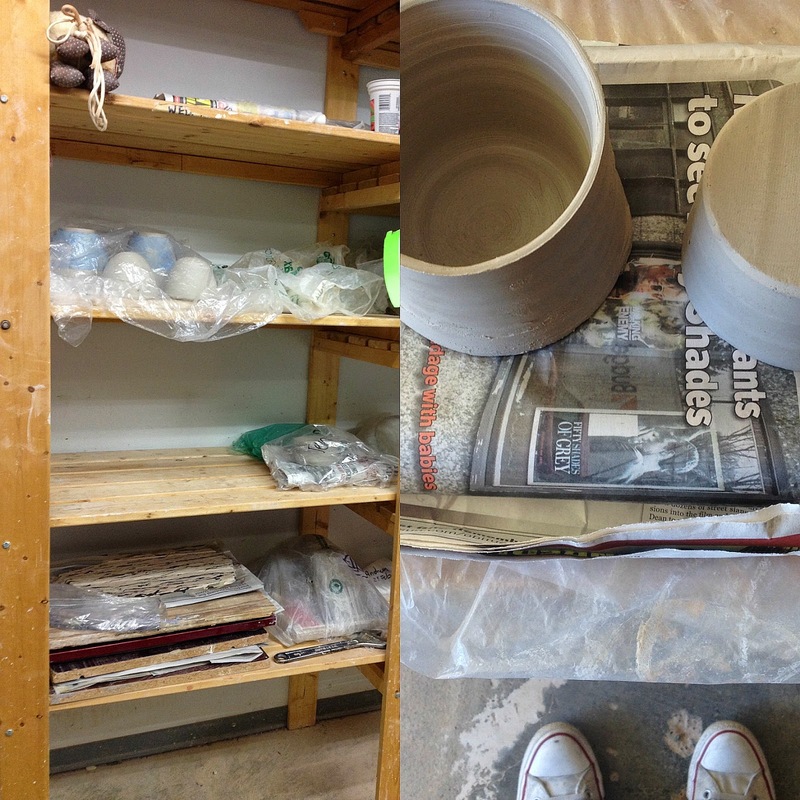 I had some big plans for some plates but at this point I am realizing just how much skill potters need to trow a really nicely balanced item- so I think I will be sticking to bowls for the moment! 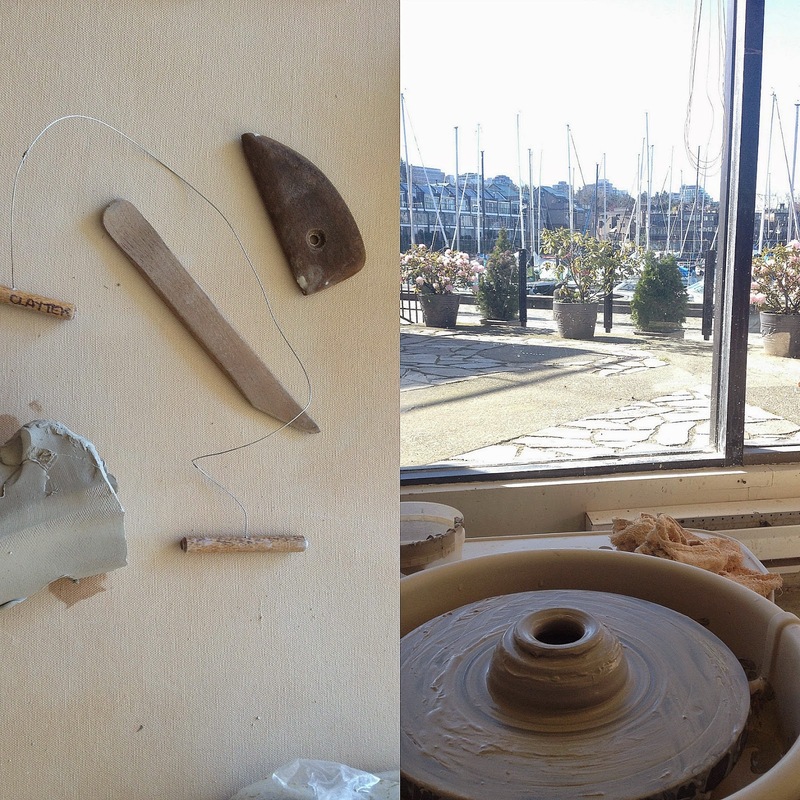 Perhaps I was overly confident walking into the clay studio- I have never met a craft or art material that is not totally intuitive- I wedged my first piece of clay like no bodies business and then sat down at the wheel to centre the piece- it was then that things got awkward- real fast. This was the first time in a very long time that I struggled to grasp a concept immediately and it was humbling wen my cylinder refused to not collapse. Several classes later I have grown to accept the long journey laid out by clay in front of me- this is something that takes time and a peaceful heart- clay will not be rushed. Slowly I am making things- cylinders- shapes- bowls- they look like real things- at the very least I will have several containers to organize my pens and pencils into! 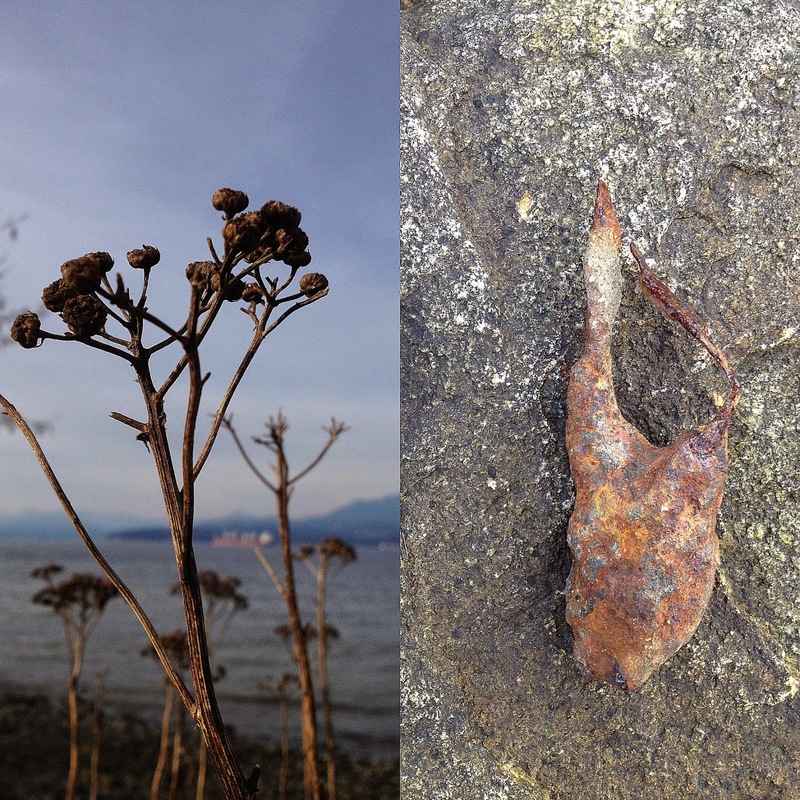 This year of making is a long process- my projects are not short ones. I knew this going in but now that I'm in the thick of knitting a sweater and throwing bowls one thing is abundantly clear- I take for granted how easy it is to walk into a store and just buy things. I always thought I knew the importance of and values the cost of stuff- but at only three months in I am realizing I have really underestimated what it takes. 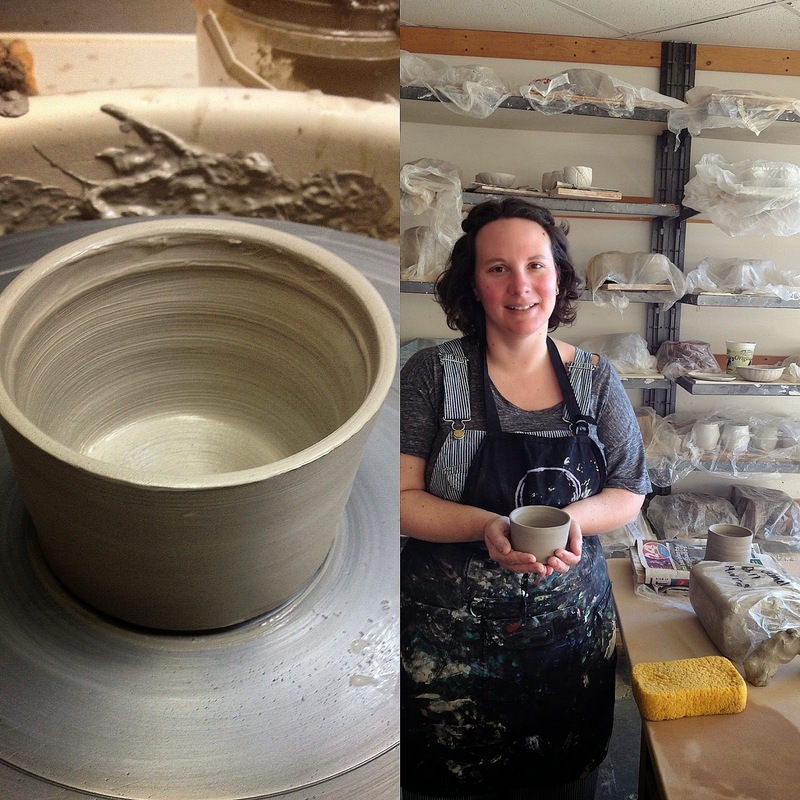 So the next time I am at a craft market or artisan sale I will not question why a hand thrown mug is $35- because I know that sometime that artist was where I am now- struggling to keep their cylinder from collapsing! PS a big thank you to Andrea Walker- Collins for taking my picture in the studio! With all the changes going on around here these days we are finding that- as a family- it is abundantly clear we need to seriously connect on the weekends- with each other and ourselves- to seak out familiar places that hold comfort. Learning to juggle family life- a full time job and my own art practice is proving more tricky than I ever anticipated- my hats go off to families that do this with babies and toddlers- we are all learning to navigate new territory here. 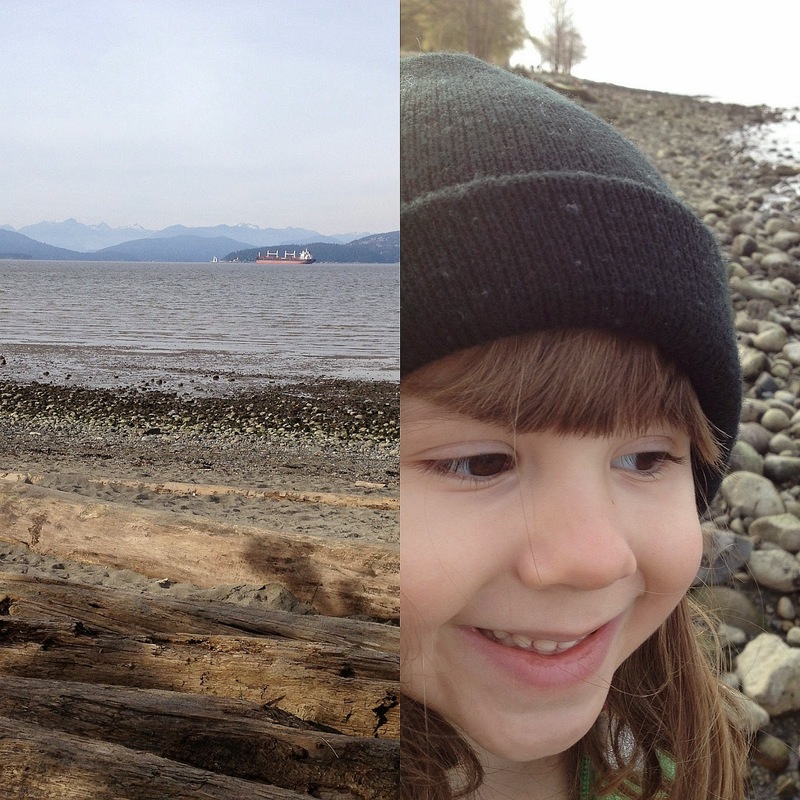 Trying to find a balance or at least find a rhythm to our days has led to me really appreciating quite family time on the weekends- this weekend we headed to our favourite spot in the city to recharge a little- Spanish Banks. 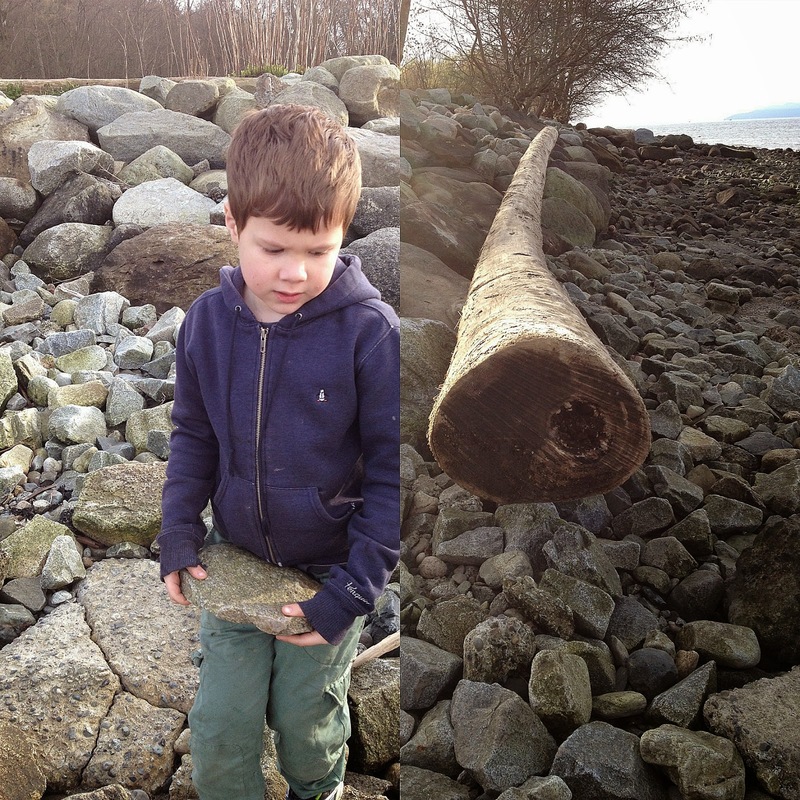 Spanish Banks has always been a place of quiet freedom for my kids- a place where they can roam without too much parental supervision- although parents are usually drawn into their play- in this case the building of Inukshuks. 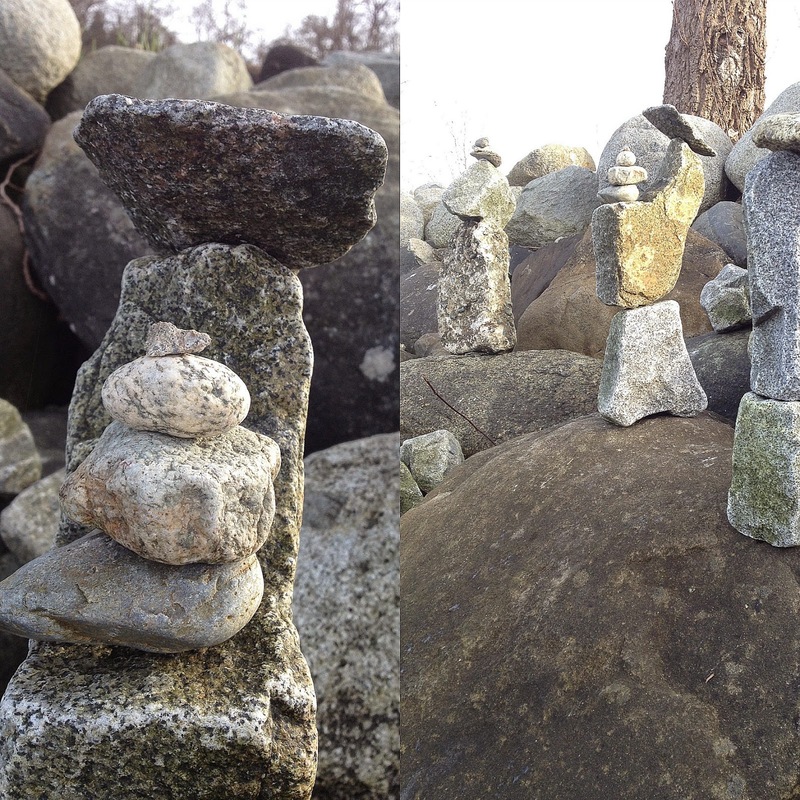 While my family builds friendship statues with rock I can sit back for a few minutes and watch the water- the waves washing away the constant chatter in my mind- a meditation on white noise. Although a slight chill still permeates the air- warm socks and hoodies keep us cozy- across the bay fog catches in the mountains and valleys- this is March on the West Coast. Watching my babes stretch their long legs as they scramble over boulders and logs I am constantly amazed at how quickly this life is speeding by- as our days become increasingly full I am mindful of my time with them. For me it's not so much about filling our time together with experiences or things- it's about being together- perfect or messy it doesn't really matter what that time looks like. While this is just a snippet of our weekend- it doesn't show the laundry or the arguing- the cartoons or the dirty floors- this is the bit that I am choosing to focus on and carry with me- deep in my heart through the week!